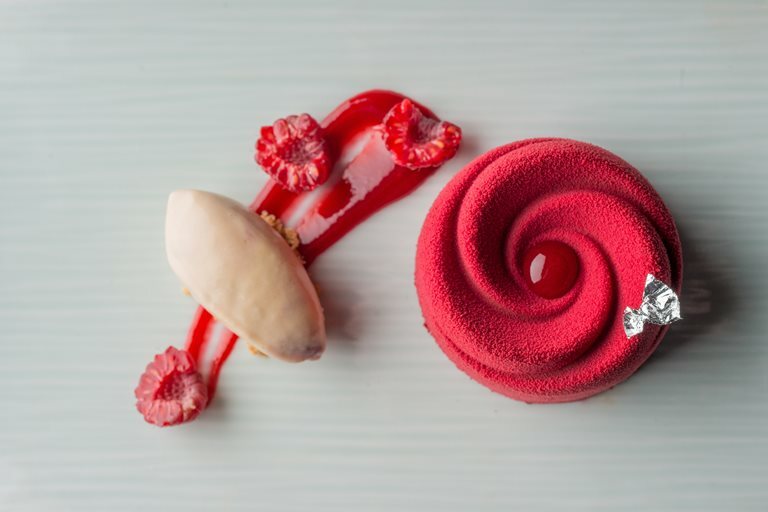 Graham Hornigold's desserts are often full of romance, and none more so than this raspberry and chocolate delice recipe. Beneath the delicate pink cocoa butter shell lie a cornucopia of delights, including a rich raspberry mousse, intense chocolate sponge and a creamy lychee panna cotta. You will need a few pieces of specialist equipment to make this recipe: food-grade spray guns are available from specialist patisserie shops or online, as are the decorative rose moulds. This dessert is a firm favourite of visitors to Yauatcha, known for its selection of Graham's stunning patisserie creations.